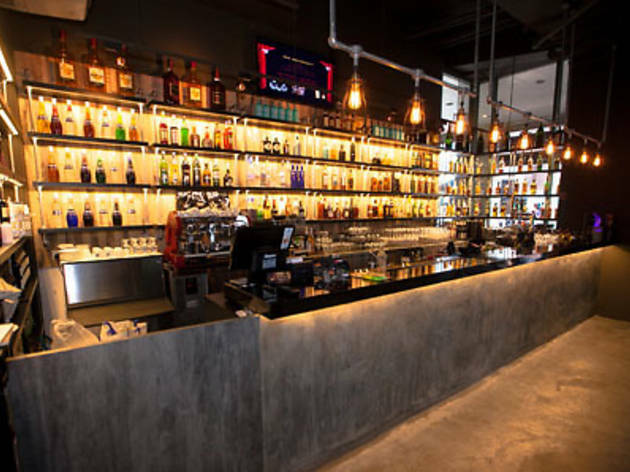 Confused whisky bar at the Tanjong Pagar end of the CBD. 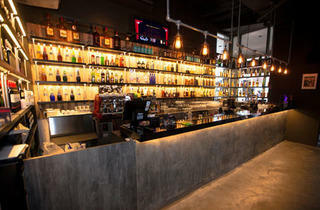 A whisky lounge for a post-work hit in the CBD certainly seems like an enticing prospect, but The Wallich, placed across the road from Studio M on Anson muddies up that simple premise with too many poorly executed frills. Borrowing dapper from Nathaniel Wallich, a Danish surgeon/botanist character who used to live in the vicinity and was BFF to Sir Stamford Raffles, the bar’s flimsy tribute to the man is perhaps in the brightly lit gentlemen’s lounge-like interiors and – unintentionally – the standing bouquets gifted by friends and family for its recent grand opening. The showpiece lounge, kitted out with chesterfield sofas, is sectioned off by impressive glass walls and shelves of rare and pricey whisky – with the labels oddly turned away from its main clientele. It’s also woefully inaccessible for the hoi polloi not willing to fork out the minimum of $600 to get a table. The extensive whisky menu is, mercifully, more accessibly priced to drink at the sports bar and not the alfresco seating outside the lounge – we were washed with bar grub fumes on our visit. The list is single-malt, Scotch-dominated, and all but five labels are available to drink by the 30ml dram, with prices topping at $40 for an 18-year-old Auchentoshan. Sadly, you get quick-melting ice-machine wedges if you ask for it on the rocks. Don’t expect too much when asking for recommendations, too. The easy answer to our request for a smoky whisky should have been an Islay Ardbeg ($16-18) or Bowmore ($13-$26), but a Yamazaki 12 ($16) and Isle of Jura 10 Year Old ($15) were presented instead, with tasting notes like ‘peppery’, ‘herbal’ and even ‘sour’ brandished to patronise to our female palate. Ultimately, what might draw return customers will be The Wallich’s attractively priced happy hour drafts: tall Tiger and Heineken pints go for $10 and Kilkenny for $11. But come with stomach pre-filled (100AM is but a grass field away).